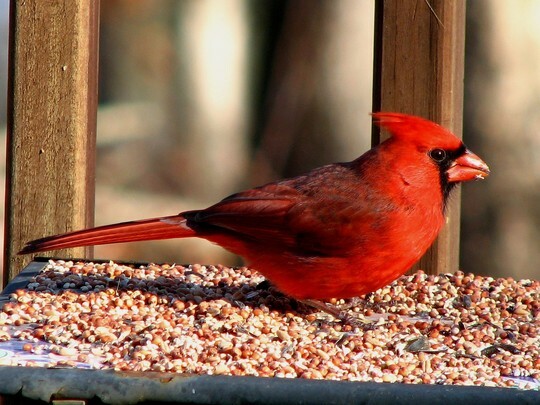 This is North Carolina's state bird, the Cardinal. These pics were taken through my dining room window. Oh....lucky you having this one on your bird table......really beautiful. He reminds me of a Waxwing though they are grey in colour....from Russia...and migrate to th UK in very cold winters for seeds..berries etc. I've put this one on my favourites also. Thanks for you wonderful comments. He really would stand out in a crowd, wouldn't he...lol. Kind of hard to miss this fella ! We have grey waxwing's here too Janey, but rarely ever get to see one, they will not eat bird seed, wonder if they look like ours ? Aren't they lovely and cheerful looking. Great shot Flcrazy. And this is Mr. Cardinal, what a beautiful bird. Such great photo's Flcrazy. I hate cleaning windows too!!! Fabulous photo as usual ! Glad to hear everyone is enjoying them. Wow, can't believe I've finally made Tasteyg just a tid bit jealous of me, life does seem to smile on me every once in a while, apparantly...lol As we all know, I'm always the one that stays green with envy over your fantastic shots...;-). They really do stand out don't they Skippy, you can see them for a country mile ! Fabulous picture. Wish we had a "County" bird here in Norfolk. Think it's a lovely idea. An amazing bird! I used to live in Iowa and saw lots of them there. Another marvellous shot, thanks, very exotic bird. Thanks Volunteer and Dotty, he's a real attention grabber. Glad to hear you got to see one in real life volunteer, so you used to live in America's heartland did you ! Mile after mile of flat land and wide open spaces, with some of the most fertile soil in America I'm told. You have the cardinal for your state bird and we have the American goldfinch for ours...both of them stand out...guess we are the lucky ones...I do envy you the cardnals though..we have the blue jays too...they are so pretty but my dad went to war with them every fall over the hazlenuts trees...I don't know why he bothered..there was always plenty of nuts no matter what...lol.. Stunning, another great photo Flcrazy. Really appreciate your comments Deida and Pottygardener thanks for stopping by and checking them out ! Hi Catfinch, The american Golfinch is a beautiful, very colorful bird too. We have them pass through here every spring, but they don't seem to stay very long.They are a real treat to watch ! I know what you are saying about the blue jays....lol. My husband's dad couldn't stand them either. Constantly trying to run them off ,while constantly complaining about how they would run all the other birds away from the feeders when they came around. The way I see it, there is always going to be a pecking order, it's just a part of life, whether your a bird or a human...lol. He just needed to relax and let nature take it's course. It wasn't like all the other birds were going to starve anyway, he had at least 5 feeders full of bird seed at all times...:-). LOL...while the nuts were getting ready for harvest the jays were obnoxious...but not as obnoxious as my dads huller that he invented..it was a metal drum he hooked to a motor to make it roll and toss the nuts around in to knock them out of the hulls..lol..you could hear it a mile away....lol...then there were the screens layed out in his very large wood shed...lol..the jays not only attacked there but also the wind in a windstorm that uprooted and knocked a very large Douglas fir over into our pigs house...lol....awh...the good old days..! What the jays and the wind did not get the mice in the eves of our house did...lol..I could hear them rolling them down my ceiling in the winter nights.....LOL...and dad pounding on the walls to shush the mice from their constant scritching and gnawing at the nut shells...lol...I swear the little pikers would roll one along the beam and lose it or maybe it ws on purpose and then take a jump and slide down my ceiling right above my head...! Good entertainment for a youngster with a vivid imagination! LOL...., I love to hear stories about the 'good ole days' ! Sounds like weeks worth of entertainment for a kid with a great imagination CF! You've got my mind wondering back in time now...lol. Thanks ! Oohh I'm jealous Flrcrazy! This is a beautiful photo. What a fantastic bird and shot! IM ENVIOUS. So many beautiful bird shots Flcrazy, I love the colour of this one! Gone to my favourites! Thanks Panther, he would look really good roosting in some of your very colorful, tropical plants, wouldn't he ?! Beautiful !!! What we miss out on livivg here in britain! Thanks Lori, I think you have some very beautiful birds in Britain that we aren't lucky enough to have...lol. The grass always looks greener on the other side doesn't it ?! I have a soft spot for Cardinals...I believe I've told you the saga of Amelia? anyway they are the most beautiful creatures! from Catfinch's post it sounds like we lived in similar circumstances as children!! it was a wonderful life then too! I'm surprised you don't see more Cedar Waxwings. They are a gorgeous bird .... and the female cardinal is often mistaken for a wax wing...when I first saw Amelia that's what I thought she was.... I was hoping to entice them into my back garden with cedars and viburnum....saw a female cardinal a week ago and this morning I saw a robin...but no waxwings! It is too bad you can't get the Waxwings to come Lori. We had a visit from a small flock last week, they really are neat little birds. They come for the berries in the trees and bushes, and sometimes for water. This last time they were chowing down on the Eleagnus berries. Yes, I forgot about the Russian Olive Wohlibuli.....I think the cardinal was attracted by the red berries hanging on the viburnum...but they are soooo sour/bitter that the birds don't bother with them...even after they've been frozen! AND a bird table !!!!!!!!! What a glorious boy to have as a State bird !